Self-stressing test structures are a powerful way to examine failure mechanisms at the wafer level. Many failure mechanisms need to be evaluated under conditions as close to the use conditions as possible. In particular, one should evaluate under AC conditions. Self-stress test structures are designed to eliminate the need for high frequency cabling and the need for high temperature ovens. This is an example of a self-stressing test structure. This particular structure is used to evaluate electromigration performance at the wafer level. It utilizes an on-board polysilicon heater for temperature control and on-board oscillators to provide high frequencies to the structure. The on-board oscillator is a voltage-controlled oscillator that can produce frequencies ranging from DC to close to those of a ring oscillator manufactured in the technology. For today's high frequency designs, it can be expensive to create high frequency cabling to test structures. By using a self-stressing test structure, one only need supply DC voltages to the structure in order to generate the high frequencies. This can permit testing of many devices in many configurations in a fraction of the time necessary using conventional reliability test techniques. Give our Online Training a try – for free. This month's topic is Time Resolved Emission. 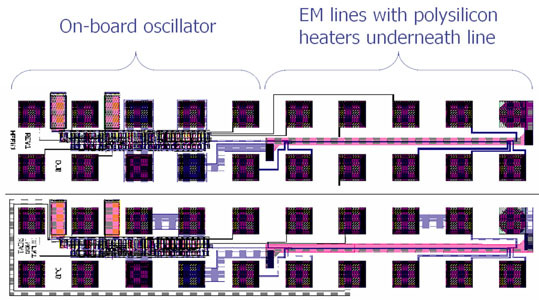 Time resolved emission is emerging as the best technique for obtaining waveform information from advanced integrated circuits during debug and failure analysis. Semitracks, along with Semiconductor International, have put together a 2-day course on Semiconductor Process Integration for CMOS and BiCMOS Technologies. Dr. Badih El-Kareh, an independent consultant, will give an overview of the process integration challenges associated with today's advanced semiconductor devices. Dr. El-Kareh will cover passive and active components, contact and interconnect issues, isolation technologies such as STI and SOI, transistor integration issues, as well as full CMOS, BiCMOS and High-Speed Bipolar Process Integration techniques. Invest in yourself and your staff. Our 2007 schedule is now available, come and learn from the experts! This intensive 4-day course offers a comprehensive examination of the wafer fab processes used to manufacture state-of-the-art microchips. Topics include semiconductor devices and ICs, silicon crystal growth and crystal defects, ion implantation, thermal processing, contamination control, wafer cleaning, LPCVD, PECVD, PVD, CMP, microlithography, etch, multilevel interconnect technology, and manufacturing technology. Process integration will be illustrated using a basic CMOS process flow.